Beatleshock: Ask Me Why: When Did Bob Wooler Acquire His Copy Of "My Bonnie"
On page 34 of The Complete Beatles Chronicle , Mark Lewisohn states that George Harrison gave Bob Wooler a copy of My Bonnie one Saturday night in August 1961 on a bus en route for the Aintree Institute. However, the single was not released in Germany until Monday, 23 October 1961, a whole two months later. 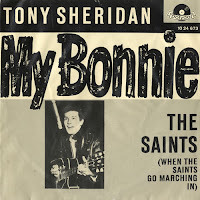 So at what point did Bob Wooler acquire the copy of My Bonnie that led to Raymond Jones asking Brian Epstein to order the single for NEMS on Saturday, 28 October 1961, just five days after the single's German release. Bob Wooler: "My Bonnie" came into my possession because I happened to get on the same bus one Saturday night as George Harrison. He said, "Look at this. I've just received it today." Stuart Sutcliffe, who had stayed behind in Hamburg the second time around, had sent him a copy of the record they had recorded for Bert Kaempfert in the spring of 1961. I grabbed it and said I was working the Aintree Institute that night. They weren't playing on that bill. They were playing the lower ballroom in New Brighton, and I said, "Let me play it tonight because you're playing the Aintree next weekend and this will be great promotion." George wanted to hang on to it because the others hadn't seen it, let alone heard it. But I said, "Look, we'll all be meeting up tomorrow night at Hambleton Hall, so I'll bring it there and play it. Then you can have it back and loan it to me again for the Cavern lunchtime sessions," which I was hosting. So he let me have it, and the first play of the record, outside George's record player, was at Aintree Institute. The Beatles did not play the lower ballroom in New Brighton until Friday, 10 November 1961 - two weeks after Raymond Jones asked Epstein for the record. It was a Saturday night, but The Beatles were not playing at Aintree Institute that night. The Beatles played the Aintree Institute every Saturday night from 12 August 1961 until 23 September 1961. Why did Stuart Sutcliffe send the single to George Harrison, not his best friend, John Lennon? This last point is important, because it raises a further question: Where was John Lennon? The Beatles played Hambleton Hall on Sunday, 15 October 1961. They had not played at the Aintree Institute on 30 September or 7 or 14 October 1961 because Lennon and McCartney had gone on holiday to Paris to meet their friend Jurgen Volmer on 30 September. 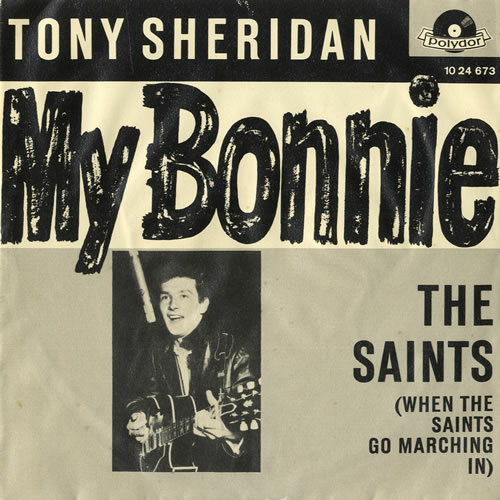 It is reasonable to assume that Sutcliffe, who was still friends with Tony Sheridan, had managed to get hold of an advance copy of the single a couple of weeks before its official release and had sent it on to The Beatles back in Liverpool. Knowing that Lennon and McCartney were in Paris with Volmer, he sent it instead to George Harrison. Harrison received it on 14 October 1961, by which time Lennon and McCartney were back in Liverpool. In fact, The Beatles were next due at Aintree Institute on Saturday, 28 October 1961, two weeks after this date. They next played Hambleton Hall on Sunday, 29 October 1961.